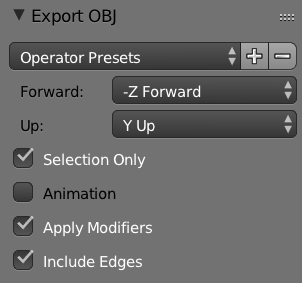 By default Blender exports every item in your scene when you choose File – Export. That’s not so good if you only want to save out a small portion of a large scene. But it doesn’t have to be that way: there’s the often overlooked Export Options on the right hand side, on the same page where you choose the file name and folder. The very first tick box is labelled Selection Only. Tick it, and only your selected object will be exported. There are plenty of other cool options in this handy dialogue too, such as Material Groups, Polygroups, Scale and so forth. Well worth checking out!